Is Anyone Twittering Out There? Last week, I mentioned that one of the hottest trends in online promotion these days is Twitter, a fairly new social network that involves micro-blogging whenever the mood hits you. Twitter has taken off and everywhere you turn someone is talking about it online or in the media. Thanks to a gentle nudge from our own Cheryl Kaye Tardif, I joined yesterday. A week ago, I kind of dreaded the idea of joining because I was reluctant to take the time to learn to navigate my way through yet another network when I already belong to five of them. But Cheryl told me that she’s holding a contest and asked if I’d be interested in donating a book or two. Well, she doesn’t have to ask twice! I don’t mind giving books away to all kinds of causes and helping other writers promote anyway they can. I have to tell you, Twitter is simple to join and it’s easy to find people and contribute. In fact, you’re only allowed 140 characters per blog entry, which is about a sentence. Cheryl’s on a mission to gather 10,000 followers (known as friends in other networks), and when she does, she’s going to give away a number of book prizes. I’ll be donating a copy of Taxed to Death and Fatal Encryption. So, if you’re curious about what people are thinking and doing, give Twitter a try at at www.twitter.com. Happily, not much personal information is asked of you, and very little of it appears on your profile page. 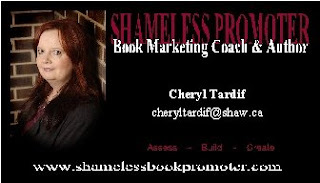 Once you’ve joined, you can find Cheryl at www.twitter.com/CherylKTardif. And you can find me at www.twitter.com/DebraPurdyKong. Hope to see you there! Are you getting ready to launch your book and haven't got a clue what to do next? Have you joined Facebook, MySpace, Twitter or other social networks but don't know what you should do with them? If you've answered 'yes' to either of these questions, then I can help you. Since publishing Taxed to Death in 1995, online promotion has grown by huge leaps for good reasons. After all, there are hundreds of websites to advertise your work and so many more people browsing and buying online than there were in 1995. Online promotion is inexpensive and can be done from home to fit your schedule. That’s the upside. The downside is that it’s also time consuming and for some, downright addicting. I mean, when you’re out there visiting, posting, browsing, and blogging on a daily basis, where’s the time for writing? At the moment, I’m on Amazon.connect, where I post blogs and keep my Listmanias going. I’m also on Goodreads, AuthorsDen, MySpace and Book Masons. I enjoy these sites because I get to meet new people, talk about books and book-related topics, or just have fun. But people now tell me that I should be spending most of my promotion time on Twitter and Facebook. Until now, I’ve refrained from joining Facebook because I heard there were privacy issues and that it was kind of a waste of time regarding book promotion. Not anymore, according to a panel of well established writers I listened to at the Left Coast Crime conference. All of the four panelists, including Dana Stabenow and Laurie King, found that Facebook and Twitter were the best social networking sites to join, not only because they reached a wider audience than say, MySpace, but also because both sites are easy to set up and navigate. Admittedly, I had to ask a couple of people for help setting up MySpace, but I do enjoy chatting with people there. Some writers tell me that Facebook has done nothing to help them sell books. Others say the same about MySpace, yet I know other writers who disagree. So, who knows? Am I totally off base by spending my time on the networking sites I mentioned? I don’t know, but I’m feeling more pressured to join Facebook and Twitter these days. If anyone would like to share your experiences with these or other social networking sites, I’d love to hear your input. To read excerpts of Taxed to Death and Fatal Encryption, visit www.debrapurdykong.com. Both books are now available on Kindle and Mobipocket! Some things happen outside of time, like running into old friends, or familiar scents, voices, landscapes and lost letters. These moments propel you to places or memories from a time long ago when you were younger, when life was simpler, and when time was not walking with you, shoulder-to-shoulder. All of these places, all past connections are woven so permanently inside the fabric of our being that at any second with the correct chemistry one or more can awake. Such a moment occurred recently when I was invited to participate in a book club discussion for my novel, Belly of the Whale. The invitation had come many months before from an acquaintance now living in the Cape Ann area, the location of my book. We shared families through marriage, in-laws, cousins and the like but we were not related. Four decades had passed and here I was at her door being welcomed as an author, treated like a celebrity. She was candid with her remarks before the group arrived. I had to read the book first she said before I could recommend it to the club and I loved it. Soon her home was filled with the hum of female voices. I was deluged with handshakes and introductions. I looked out among the faces and saw women like myself holding copies of Belly of the Whale. Questions began and I answered. How did the story begin, what was the seed? I knew the responses because I’d made them before, but this was different, that night I was a bridge away from Gloucester, from Ten Nettles Cove and Whales Market. One woman after another exclaimed that they looked for the Market and wondered what street it was on and how thoughts of the story remained with them long after the last page. When would the sequel be released? Was there a sequel? What was I working on now? When would my next book be published? The walls of inertia that had formed around me in the last few months began to crumble. Every writer requires retreat, time to ruminate and I had mine. The alarm was going off in my head. A room full of wonderful women speaking with honesty and passion was my elixir. On April 10th I will dedicate my blogging to the education and awareness of prostate cancer. In December 2007 Dan Folgelberg died of this disease. He was barely past fifty years old. We all know his music- Same Old Lang Syne and Leader of the Band to name two. I will participate in the promotion of a double CD package called Dan Fogelberg-A Retrospective Interview. The CD’s feature thirteen of Dan’s great songs coupled with Fred Migliore of FM Odyssey Radio and his interview celebrating Dan Fogelberg’s twenty-five years of music in 1997. Three dollars from the sale of this package goes to PCF in Dan’s name to help find a cure. Please remember to the fight-fight. Can a man join Sisters in Crime? As my friend and fellow author Austin S. Comacho puts it: "This mister's a sister." In his latest blog post at Criminal Minds at Work, Austin explains why he decided to join the predominantly all-female writers' organization known as Sisters in Crime. If you're a male writer, you'll want to read this. "Originally I joined because I wanted to support the cause - to combat discrimination against women in the mystery field and raise awareness of their contribution to the field. Soon after I joined I realized that..."
Read Austin's post at Criminal Minds at Work. Yesterday, I was eating breakfast on a sundeck, barefoot and in my sundress, watching swaying palm trees and a rainbow arcing up into the clouds. Today, I was walking with my umbrella, winter gloves, boots, and two layers of clothing under a heavy coat after arriving home from Hawaii at about one a.m. this morning. Don’t you hate it when that happens? On the other hand, maybe I wouldn’t have appreciated the heat and sun as much if it had been the same weather here in the pacific northwest. I mean, there’s a good reason people go to tropical climates in winter. My good reason was the Left Coast Crime conference at the Waikoloa Marriott Beach Resort. This was my first trip back to Hawaii since 1981 and my first time ever on the Big Island. What a place! The variety of vegetation and geography alone could fill a couple of blogs, but I want to talk about the wonderful LCC conference organized by Toby and Bill Gottffried and a team of friendly committee members who helped make the conference memorable, fun, and relaxed. As always, the best part of going was meeting new people; some aspiring writers and others fans of mystery novels. I’ve come back recharged, raring to work on various writing projects. The third draft of my current work in progress had been going painfully slow, but I’ve edited four chapters this week alone, thanks to my husband’s laptop and my trusty flash drive. I wasn’t sure I would work in Hawaii at all, but the desire to write was revving up, so I spent an hour a day on the book, and the rest of my time was devoted to conference fun, site seeing, and shopping. If you’ve never been to a conference before, save up and treat yourself, and make the most of the panels and discussions and social events. Writers especially need to network and these events present great opportunities. There are all types of conferences for different genres or just general writers’ conferences. If you Google key words in your area of interest, you’ll find a huge source of information. And if you know of a great one to recommend, feel free to contact me and I’ll share the info with others. T-Mobile's latest ad, filmed at Liverpool Street Station in London, tells us "Life's for sharing". I believe that. Sharing joy, sharing love, sharing peace, sharing hope, sharing stories, sharing dreams, and sharing life. Only when we are truly sharing are we truly experiencing life. After watching this video, I dare you to tell me you weren't affected by it. How many of you smiled while watching? How many of you danced in your chair or wanted to get up and dance? How many of you had tears in your eyes? And how many of you wished you could have been there to experience this live? I sure do. Only the professional dancers knew what was going to happen. How does this video make you feel? Remember, "Life's for sharing", so please share this video. How's That Novel Going, Hmmm? Ever had one of those relatives who gives you a hard time about when you are going to finish your novel? I know I do. Instead of telling people I write books, lately I've been thinking of telling people I'm a plumber. But then, maybe that will bring other unwanted questions. Visit my daily blog - http://www.scobberlotch.blogspot.com/ But if you ask me if my current novel is finished, well, I might have to make something up. In a news story that sounds like it should have been included in a chapter of my thriller The River, it appears that a huge breakthrough in stem-cell research has been made between Dr. Andras Nagy of Toronto's Mount Sinai Hospital and Keisuke Kaji of the Medical Research Council Centre for Regenerative Medicine at the University of Edinburgh, and their teams. Anne McIlroy from the Globe and Mail reports, "Canadian researchers have discovered a new way to turn skin cells into stem cells with fewer potential risks to patients...Dr. Nagy and his colleagues are the first to reprogram human skin cells to an embryonic state without using a virus..."
So does this mean that scientists are well on their way to finding something to slow the process of aging? I mean, if they can revert a cell to an embryonic state, what does that mean for those who are obsessed with staying young? For now, they're looking at ways to use this technology to eliminate diseases like diabetes or Parkinson's. One day, this research might be responsible for curing cancer. Or this technology may end up repairing damaged hearts, kidneys, livers or even growing new organs. The possibilities are endless. That is exciting! How interesting that something I wrote about is actually more of a possibility. Fiction becomes fact. Let's hope that the horrible atrocities that occur in The River as a result of such technology doesn't happen in real life. You can read the Globe and Mail story HERE. MSNBC also carries a story on this breakthrough. Read it HERE. The South Nahanni River has a history of mysterious deaths, disappearances and headless corpses, but it may also hold the key to humanity’s survival--or its destruction. Gathering a group of volunteers, Del travels to the Nahanni River to rescue her father. There, she finds a secret river that plunges her into a technologically advanced world of nanobots and painful serums. Del uncovers a conspiracy of unimaginable horror, a plot that threatens to destroy us all. Will humanity be sacrificed for the taste of eternal life? You can buy The River online at Amazon or Chapters, or ask your bookstore to order it for you. Writers are on my mind a lot these days, but then they usually are because I’m always reviewing someone’s book, meeting with my critique group, plus chatting with and making new online friends all the time. But with the Left Coast Crime conference coming up in Hawaii, I’m especially thinking about this special gathering of writers. Some of my favourite authors will be there as will many new writers eager to sell their books, meet potential fans and schmooze with the famous. I hope they won’t be disappointed. The truth is that only a small percentage of authors make a living from writing, mainly after years of learning their craft and building writing credits. There’s simply too much competition and too many writers willing to work for little or no pay. Perhaps Ms. Suleman’s fame and unique situation will result in a publishing contract with a big advance. But with acquisition freezes and massive layoffs in the publishing world these days, who knows? What really worries me is that I’ve heard and read about people who are counting on writing income as part of their retirement plan. And some of these people are just starting to write as they approach their retirement years. I hope they do their homework. Don’t get me wrong. It’s wonderful to dream and ambition is necessary, but I worry about those who set themselves up for failure because they didn’t learn how the business of writing really works. If you know someone like this, make sure they take a reality check before they place every egg they own in their creativity basket. See you when I'm back from Hawaii!! To read excerpts of Taxed to Death and Fatal Encryption, visit http://www.debrapurdykong.com/. Both books are now available on Kindle.